Frederik Georg “George” Frederiksen was born August 28, 1874 in Høsterkøb, Frederiksborg, Denmark to Christen Frederiksen and Ane Lisbeth Jørgensen. He was the second of six children born to Christen and Ane. 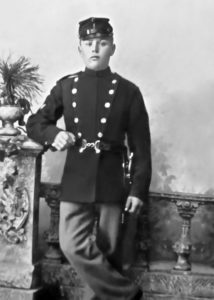 On August 16, 1882, George’s mother died, leaving Christen a widower with six children, the youngest, Edvard Vilhelm, being just over a month old. The loss of George’s mother resulted in the older boys being sent away to work. The three oldest are in the 1890 Danish census with their household position listed as ‘tjenestetyende dreng,’ which loosely translates to ‘service servant boy,’ in English. 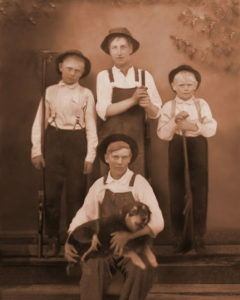 Older brother Jørgen Pedar is shown living/working for the Christoffer Jensen family, in Sandbjerg, George is shown at the widow Marie Johanne Helene Lund’s farm, in Høsterkøb; the youngest of the three, Thorvald is with the Ole Andreasen family, in Høsterkøb. 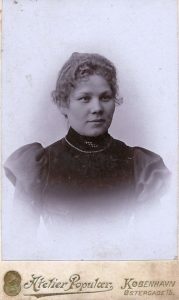 The three youngest children were living with Christen and his 2nd wife, Marie Jensine Pedersen, in Høsterkøb. Little more is known about George’s childhood and life during this time. According to the Danish Constitution all physically fit men over the age of eighteen are required to serve one year in the Danish Military. The photo on the left is George, during his time of military service, the date is probably between 1892 and 1893; he would have been eighteen in August of 1892.